Cold winters require those of us here in the northeast to double up on the throw blankets in the living room, switch out our warmer weather bedding with heavy quilts, and in rooms with no carpeting, lay down a rug for a layer of warmth underfoot. In our Winter 2019 catalog, we’ve introduced a few rugs and accent mats that are practical and stylish (in all seasons), and have provided a peek at the collections below. Made in the USA and available in six sizes, our Cora Area Rug features a luxurious pattern and pile; this home accent is both decorative and plush, and its easy-care polypropylene fibers makes it low maintenance and durable for your most lived-in rooms. Made in the USA, available in twelve sizes and three colors, our Oceanview Chenille Braided Rug blends softness and practicality with rich colorways to brighten your home and comfort you all year long. 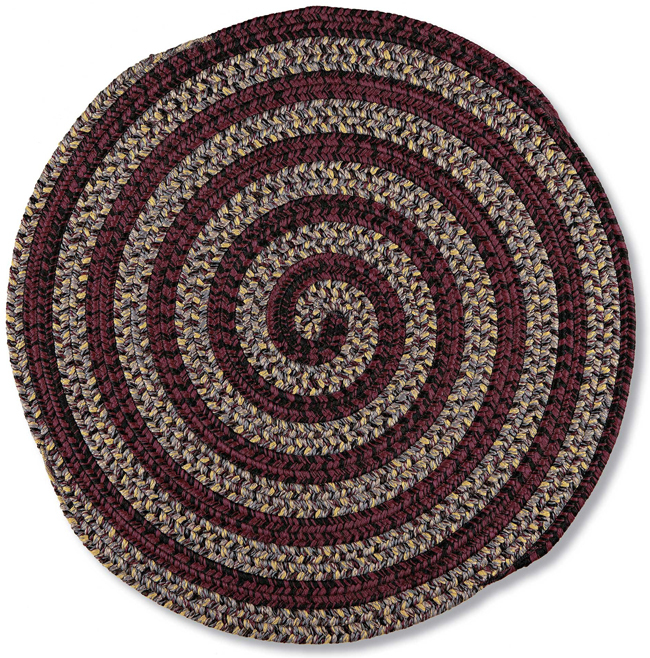 Made in the USA from easy-care polypropylene, the Essie Swirl Braided Rug comes in two dark color combinations and three round sizes. 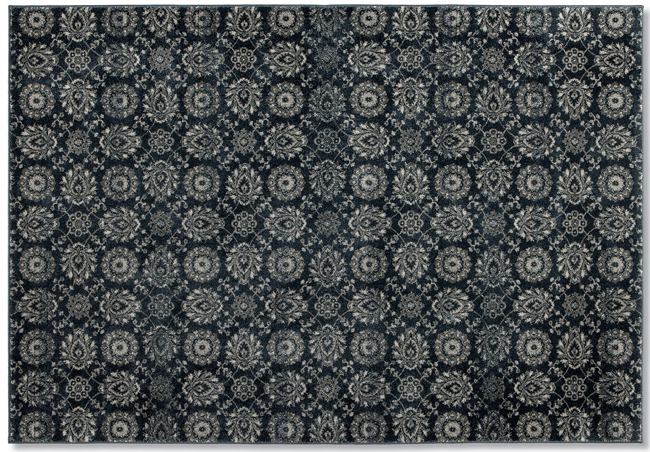 Perfect for entryways, dining rooms or even a bedroom, this rug is just right for smaller spaces. 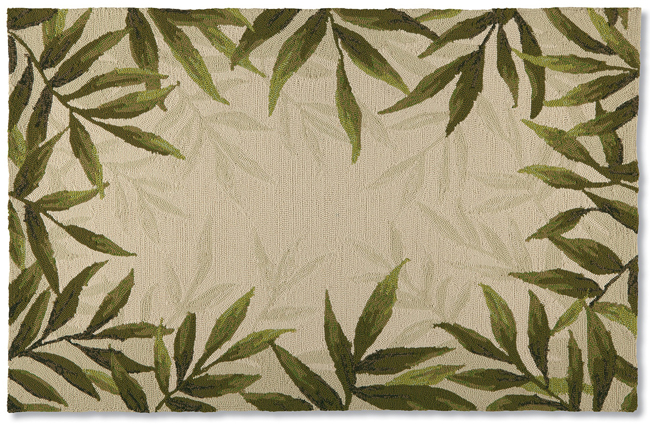 We will take all the extra greenery that we can get in the winter time; enter the Forest Fern Area Rug! Made in the USA and available in five sizes, this is another easy-care polypropylene option from our catalog. 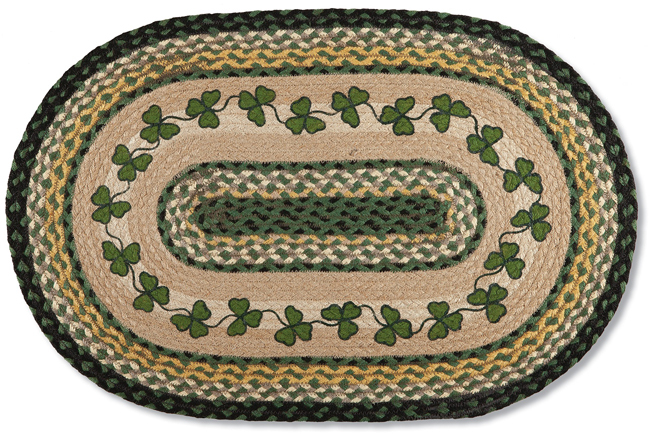 And finally, our Green Shamrock Braided Rug. 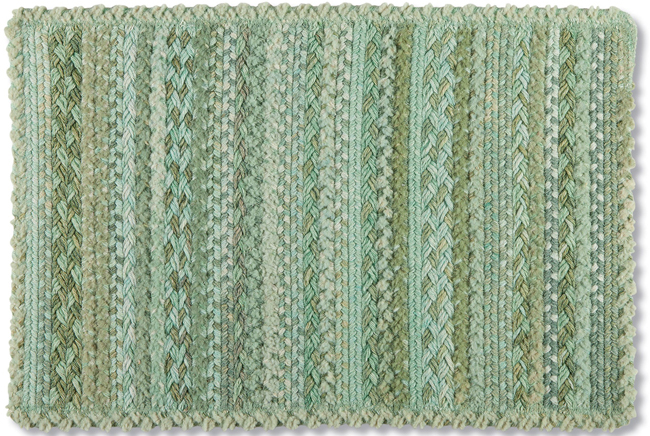 Crafted out of eco-friendly jute braids and designed by Maine artist Harry Smith, this home accent is perfect for the kitchen, entry or a hallway in your country home. Welcome to our first October Spotlight. On the agenda: braided jute! Below we are featuring our newest jute home accents that will cover your chairs, tabletops, counters, floors and other areas of your home this holiday season and throughout the year. To showcase them all, we’re breaking from our usual five format and including each new piece. 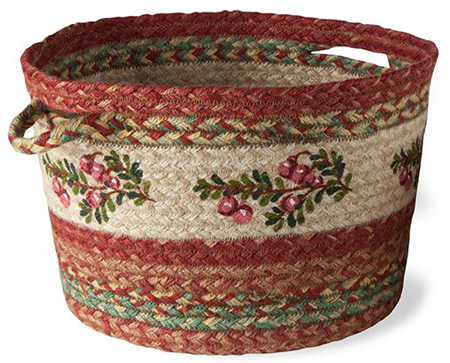 If you are already acquainted with our Cranberry Jute Collection, you’ll be delighted to know that we’ve added Baskets and a Floor Runner to the mix for even more complementary style. All of these pieces feature a design by Maine artist Harry Smith, and are perfect for holiday decorating or for incorporating a little color into your home all year long. 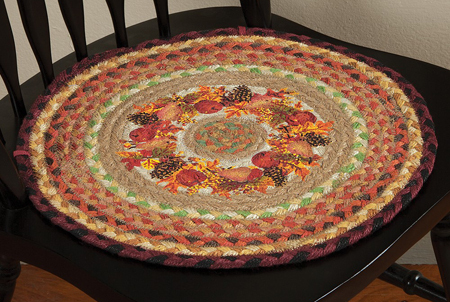 To coordinate with our vibrant Autumn Jute Rug by artist Sandy Clough, we’ve introduced the Autumn Jute Chair Pad to bring a touch of fall into your dining areas as well as the other rooms of your home. A mixture of warm colors with bright green and teal make this jute accent electrify your country chairs with seasonal appeal. 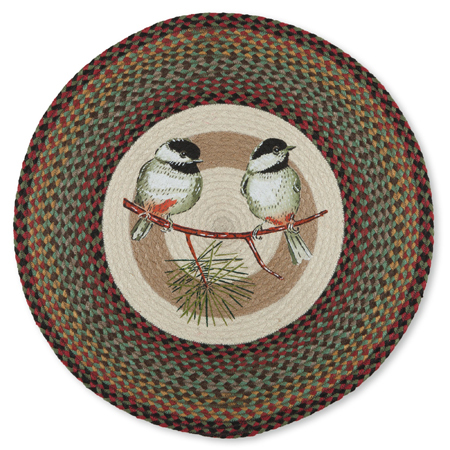 Also from Sandy Clough is the Chickadee & Pine Jute Collection. In addition to the Chair Pad and Tabletop Accents, we now offer a beautiful Area Rug. 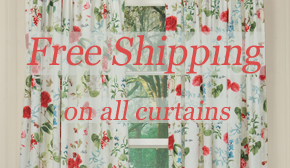 This Collection is perfect for a log cabin, lodge or woodland-inspired home, and we’ll admit our partiality to it since it features the Maine state bird and part of the Maine state tree. Last but certainly not least (and also by artist Sandy Clough), is our new braided jute collection. 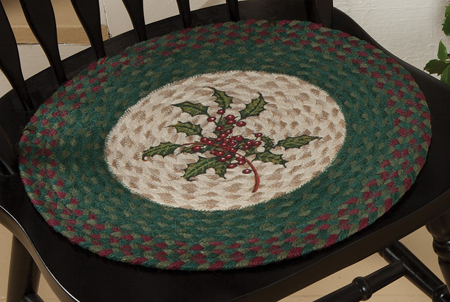 The Holly Jute home accents feature green and burgundy braids circling a full sprig of holly leaves and berries. An Area Rug made for your floors; a Chair Pad for your dining room; and a Trivet for serving hot dishes in the kitchen or adding a holiday look to a table; all three make great statement pieces and create a cheerful atmosphere when used all together. Having a respect and appreciation for nature, while understanding the beauty of Maine and all it has to offer, is a talent that Maine artist Harry Smith knows hows to capture in his work. We are proud to carry a selection of Harry Smith’s designs on some of our 100% jute accent rugs. His artwork evokes feelings of summers past, peaceful countrysides and vacations spent in both rural and coastal Maine. Currently, Harry is living and working in an old sea captain’s home of the 1860’s, on Mt. Battie along side the coast of Camden Hills (Down East coast of Maine) with his wife Marsha. The home provides inspiration to all aspects of his work, due to the rich nature that surrounds him. Seen here to the left is a new rug offered at Sturbridge Yankee Workshop that could be used as an accent rug or doormat in your home. A multi-colored, braided border frames the image of a red covered bridge surrounded by forest. There is an emphasis of green within the colored braid, highlighting the lush, Evergreen trees ever so nicely. 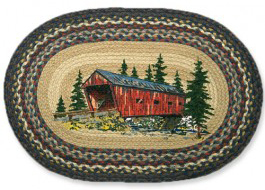 We know you’ll love this Covered Bridge Rug, as it really is artwork for your floor. Made of 100% natural jute, this rug offers a tranquil moment in an entryway or hallway of your home. As with all our jute rugs, made from a biodegradable fiber, it is an eco-friendly choice. our Blueberry Rug. Blueberries and Maine have become synonymous over the years as it is our official state fruit, producing 25% of the low bush blueberries in North America. These treasured little blueberries are seen here in a small basket, peraps after a long day picking in the fields. 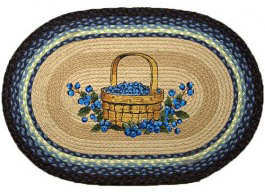 Atop a bush of more blueberries, the image is set against a cream background and displays a distinctive deep blue braided border. Other Harry Smith designs at SYW include those featured on our Lobster Rug and our Portland Head Light Rug; both presenting the true beauty that is, Maine.